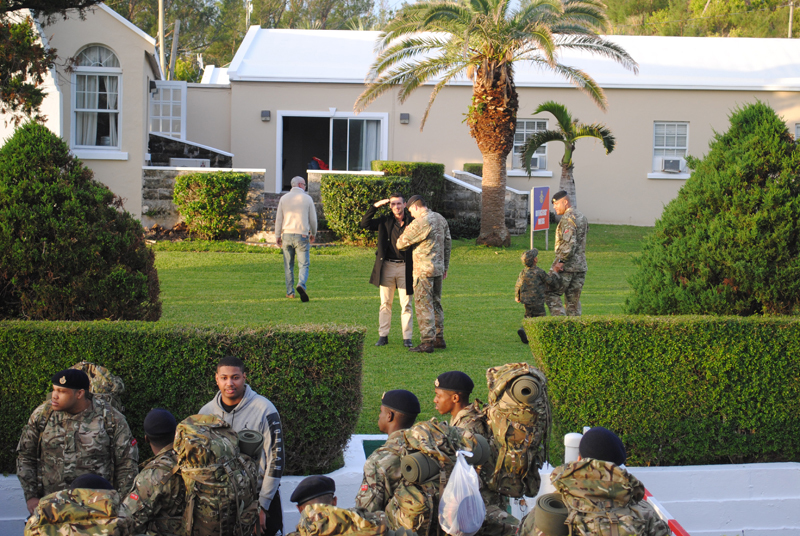 [Updated with video] The Royal Bermuda Regiment’s second-ever all-volunteer Recruit Camp began this morning [Jan 15], with 60 new recruits entering the gates of Warwick Camp to begin two weeks of training. 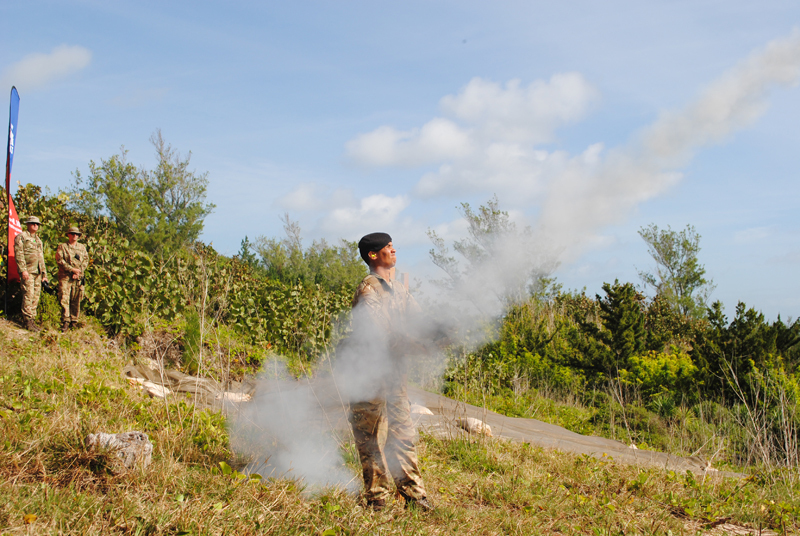 One of their first lessons was a demonstration on South Shore of pyrotechnic training aids and the firepower the RBR armoury can muster. Lindley Scott, 29, operations supervisor at airport specialist caterer Goddard Catering, said he signed up to boost his resume and for the chance to serve as part of the security team for the America’s Cup. Private Scott added: “I joined for a personal reference for myself and to help me in the future. Minister for National Security Senator Jeff Baron chats with RBR CO Lt Col David Curley after he mingled with troops waiting to enter the gates of Warwick Camp to start their training. Fellow member of 8 Platoon, 19-year-old Kyle DeRoza added: “I’m feeling good. I’m looking forward to the running, but I joined to get a better understanding of the Regiment and to become a man. Steffan Adderley, 25, who works for Menzies Aviation at the airport, said he hoped to use RBR training as a springboard to a career as a professional soldier in the UK. Taylor Eve, 25, said: “I joined for the adventure and to meet new people. It’s something new – I’m very nervous, but looking forward to it. Corporal Michael Cann [centre] an instructor with 8 Platoon for the RBR’s Recruit Camp, with new soldiers Kyle DeRoza [left] and Lindley Scott. Lieutenant Colonel David Curley, new RBR Commanding Officer and in charge of his first Recruit Camp, explained that, while the RBR offered opportunities for personal development and fitness, it should be fun and exciting as well. Col Curley said: “I’m very optimistic about the calibre of people we have seen this year. We have made enormous efforts to get across that the Regiment is not just worthwhile and character-building, but enjoyable as well. 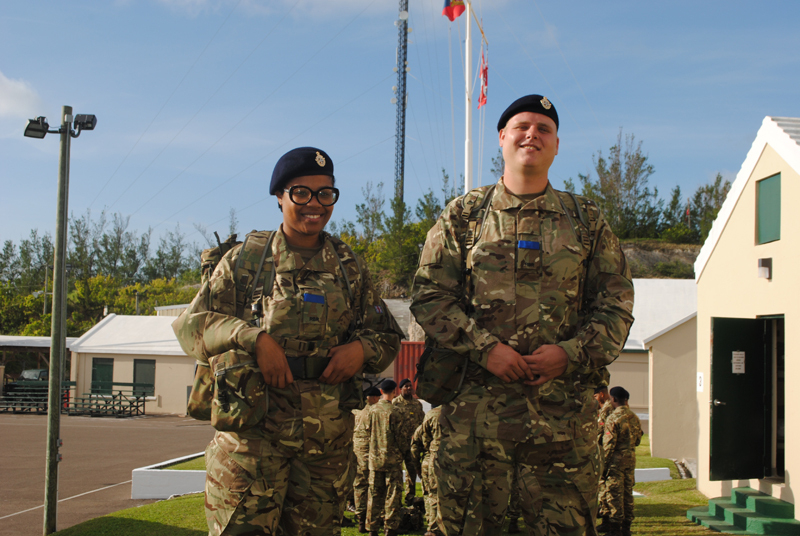 New soldiers Taylor Eve and Steffan Adderley settle into life as trainees in the RBR’s 8 Platoon. 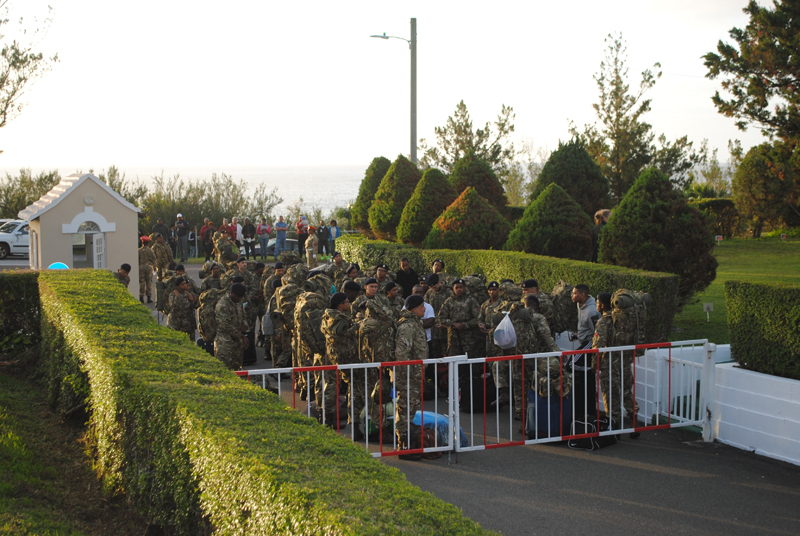 “The soldiers here want to be here and they volunteered, so that’s a great asset. We will push them to their limits and some of them will be able to volunteer for extra training for America’s Cup assistance on the water or on land. We will be supporting the police 100 per cent as we always do. The recruits also had a surprise visitor as they waited outside Warwick Camp – Senator Jeff Baron, the Minister for National Security, who is due to pay an official visit tomorrow [MON] with Premier Michael Dunkley. Minister Baron said: “The volunteers who have chosen to serve Bermuda deserve the Minister’s support from day one and I wanted to be here to show them that. I wanted to look them in the eye, feel their nervous energy and tell them I support them. 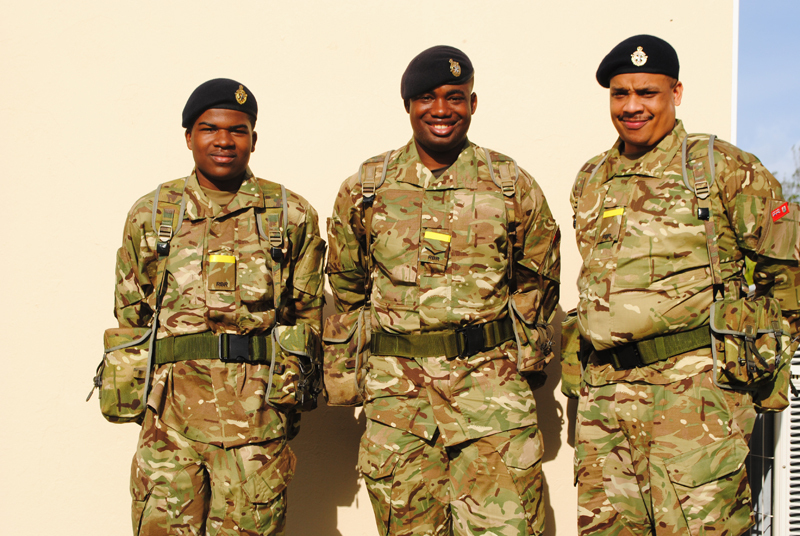 Minister Baron added: “Service in the Royal Bermuda Regiment offers those seeking an opportunity to serve their community and gain valuable skills and training. I know the team worked hard at marketing and promoting the merits of volunteer service in the Regiment. If Seahorses or Paradise took odds on who will make the first ignorant statement after each news article posted on Bernews. Terry or Onion Juice would be the odds on favorites. What statement would have made you happy. “Our team didn’t try at all” or “our team did nothing to promote this”. That’s great! 60 recruits who want to be there. That is the way it should be. Half the number it used to be also for camp. Better still. being paid to join is what drives the numbers to be there, thats not totally volunteering. A several of them leave after the payments are made. Meaning the “5 Kernels” and supporters who have all along said it couldn’t be done were dead wrong, and we forced scores of men to serve unwillingly or be locked up for no good reason. Apology coming? This is so cool. I would have loved to volunteer when I was that age, but as a woman, it wasn’t much of an option. It’s an amazing opportunity for our young people and I think it’s so valuable to proactively offer it to volunteers. All the best to the new recruits!